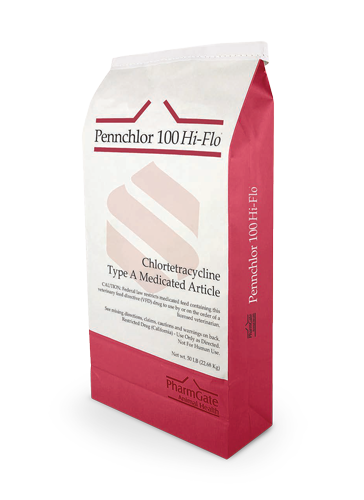 For Turkey Poults Under 4 Weeks of Age: Reduction of mortality due to paratyphoid caused by Salmonella typhimurium susceptible to chlortetracycline. For Breeding Sheep: Reducing the incidence of (vibrionic) abortion caused by Campylobacter fetus infection susceptible to chlortetracycline. For Swine: Reducing the incidence of cervical lymphadenitis (jowl abscesses) caused by Group E Streptococci susceptible to chlortetracycline. For Growing Cattle (Over 400 lbs. ): For the reduction of the incidence of liver abscesses. WARNING: A WITHDRAWAL PERIOD HAS NOT BEEN ESTABLISHED FOR THIS PRODUCT IN PRE-RUMINATING CALVES. DO NOT USE IN CALVES TO BE PROCESSED FOR VEAL. WARNING: ZERO-DAY WITHDRAWAL PERIOD. For Beef Cattle: For the control of bacterial pneumonia associated with shipping fever complex caused by Pasteurella spp. susceptible to chlortetracycline. For Beef Cattle (Under 700 lbs. ): Control of active infection of anaplasmosis caused by Anaplasma marginale susceptible to chlortetracycline. For Beef Cattle (Over 700 lbs. ): Control of active infection of anaplasmosis caused by Anaplasma marginale susceptible to chlortetracycline. 0 days for livestock and turkeys. Ingredients: Chlortetracycline calcium complex, calcium carbonate, roughage products, mineral oil.